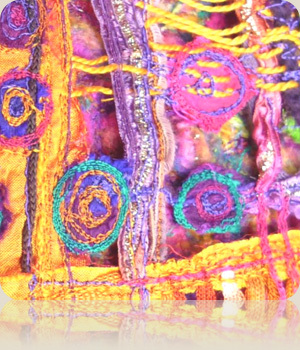 I provide textile and artistic workshop days for Guilds, Textile Groups, Schools and enthusiasts. This has taken me to all corners of the country and indeed abroad. Now, however, I am also providing these workshops within my own home studio in Westcott, a village near Dorking, Surrey. A fun day of creative work with friends can be arranged. I can take a minimum of 4 students and a maximum of 8. Off street parking is available. Mainline station is Dorking. Click one of the links above for more information about the workshop.